This book discusses how civil society, public debate and freedom of speech affect the management of natural resources. 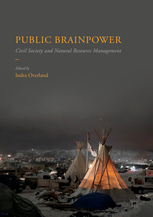 Drawing on the work of Robert Dahl, Jürgen Habermas and Robert Putnam, the book introduces the concept of public brainpower. Good governance of natural resources requires fertile public debate – to conceive new institutions, to provide checks and balances on existing institutions and to ensure their continuous dynamic evolution as the needs of society change. The book explores the strengths and weaknesses of these ideas through case studies of 18 oil and gas-producing countries: Algeria, Angola, Azerbaijan, Canada, Colombia, Egypt, Iraq, Kazakhstan, Libya, the Netherlands, Nigeria, Norway, Qatar, Russia, Saudi Arabia, the UAE, the UK and Venezuela. The concluding chapter presents 10 tenets on how states can maximize their public brainpower, as well as a ranking of how well 33 resource-rich countries have succeeded in doing so.